The South Moravian Region (Czech: Jihomoravský kraj; Slovak: Juhomoravský kraj; German: Südmährische Region) is an administrative unit (kraj) of the Czech Republic, located in the south-western part of its historical region of Moravia (an exception is Jobova Lhota which belongs to Bohemia). Its capital is Brno, the 2nd largest city in the Czech Republic. The region has 1,169,000 inhabitants (as of 30 June 2013) and the total area of 7,196.5 km². It is bordered by the South Bohemian Region (west), Vysočina Region (north-west), Pardubice Region (north), Olomouc Region (north east), Zlín Region (east), Trenčín and Trnava Regions, Slovakia (south east) and Lower Austria, Austria (south). There are in total 673 municipalities in the district of which 49 have the status of towns. There are 21 municipalities with extended powers and 34 municipalities with a delegated municipal office. The region is famous for its wine production. 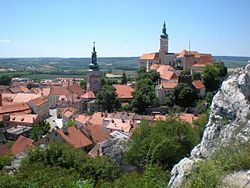 The area around the towns of Mikulov, Znojmo, Velké Pavlovice along with the Slovácko region provide 94% of the Czech Republic's vineyards. The total population of the region as of 30 June 2012 was 1,168,975 inhabitants. The number of inhabitants has been growing since 2002. The net migration has been positive in all years since 2003, reaching its peak in 2007 when it reached 7,374 people. Since 2007 the region has also experienced natural population growth. In 2012 there were 37 thousand foreigners living in the region, forming 3.2% of the total population of the region. The average age of citizens in the region was 41.5 years in 2012. The average age has grown by 5 years over the last two decades. The life expectancy at birth in 2012 was 75.2 years for men and 81.7 years for women. Life expectancy has been growing over recent years. The divorce-marriage ratio in the region was 60.3 in 2012. One third of the region's population lives in the capital Brno. The share of inhabitants living in towns and cities on the total population of the region has been steadily decreasing due to suburbanization. The table below displays 12 municipalities with the highest number of inhabitants in the region. 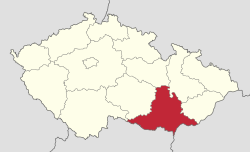 With an area of 7,196.5 km² the South Moravian Region is the fourth largest region of the Czech Republic. The highest point of the region is located in the eastern part on Durda mountain (842 m). The point with the lowest elevation (150 m) is situated in Břeclav District at the meeting of the rivers Morava and Dyje. The northern and north-western part of the region is covered by the Bohemian-Moravian Highlands (Czech: Českomoravská vrchovina) and the Moravian Karst. There is an extensive cave complex in the Moravian Karst with a 138.5 m depth in the Macocha Gorge in the Punkva Caves. In the eastern part, the region reaches to the Carpathian Mountains. The Bohemian-Moravian Highlands and the Carpathian Mountains are separated by the Lower-Moravian Valley (Czech: Dolnomoravský úval). The southern part of the region is predominantly flat and dominated by fields, meadows, and the remainders of riparian forests. The largest river of the region is the Morava river. Other significant rivers are the Dyje, Svratka (and its tributary the Svitava), which are all tributaries of the Morava river. The whole region belongs to the drainage basin of the Danube and subsequently of the Black Sea. There are a number of landscape parks (Czech: chráněná krajinná oblast) located across the region: the White Carpathians Landscape Park, the Moravian Karst Landscape Park and Pálava Landscape Park. Moreover, Podyjí National Park is situated in the south-eastern part of the region. In 2016, three quarters of households in the region had a computer and 75% of the households had Internet connection. There were in total 781 thousand motor vehicles, of which 482 thousand were cars and 110 thousand were motorbikes. The unemployment rate in the region was 4.3% as of October 2017. The nominal gross domestic product of the South Moravian Region was 397.2 billion CZK in 2011, which is 10.3% of the national GDP. Among other regions, South Moravian Region had the third largest share on the national GDP. The GDP per capita was 341,000 CZK in the same period, which is 93.6% of the national average. Mechanical engineering has an essential role in the economy of the region. 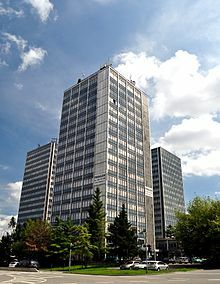 Important centers of mechanical engineering are Brno (PBS, Siemens, Zetor Brno), Blansko (ČKD Blansko, Metra Blansko), Kuřim (TOS Kuřim), Boskovice (Minerva, Novibra) and Břeclav (OTIS). Electrical engineering has a tradition for more than a century. 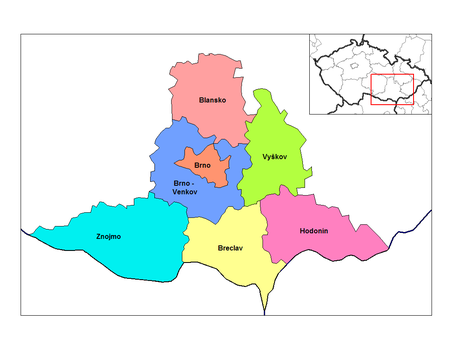 Significant producers are Siemens Drásov, VUES Brno and ZPA Brno. Food industry forms another important sector, especially in the southern and eastern part of the region. Important activities are the meat processing, canning of fruits and vegetables (Znojmia, Fruta), sugar industry, brewing (Starobrno, Černá Hora, Vyškov and Hostan) and winemaking (Znovín Znojmo, Vinium Velké Pavlovice). Chemical and pharmaceutical industry is concentrated especially in Brno (Pliva-Lachema), Ivanovice na Hané (Bioveta) and Veverská Bítýška (Hartmann Rico). The South-Moravian Region has an important role in the nation and international transit. It is served by a network of motorways and roads of almost 4,500 km. The motorways D1 and D2 and the expressways R43 and R52 form the skeleton of the road network in the region. Brno is an important crossing of road and railway transport and a hub of the integrated regional public transport system. Brno has an international airport Brno–Tuřany. The airport was opened in 1954 and in 2012 it served 535 thousand passengers. The agricultural land covers 426 thousand ha, which is 59.3% of all land in the region. The arable land occupies 49% of the total area. Znojmo District and Vyškov District have the highest proportion of arable land in the region. The agricultural production is oriented on the production of cereals, rapeseed and sugar beet. Other important agricultural sectors in the region are viticulture, fruit farming and vegetable growing. The viticulture is especially developed in Břeclav District, which has 46% of the total area of Czech vineyards. Brno with Cathedral of St. Peter and Paul, Villa Tugendhat, Capuchin Crypt, etc. ^ "Statistiky VDB". vdb.czso.cz. Retrieved 17 March 2018. ^ "Podíl nezaměstnaných v Jihomoravském kraji - ČSÚ v Brně". www.czso.cz. Retrieved 17 March 2018. This page was last edited on 7 January 2019, at 10:16 (UTC).